"Effective test automation for terminal-based software"
Effective test automation for terminal-based software can be developed quickly and efficiently. A high degree of coverage and a good return on investment can be achieved while improving software quality. The process and level of effort for building automated tests for terminal-based applications are similar to that of automating tests for applications running on other platforms, including MS Windows and the web. 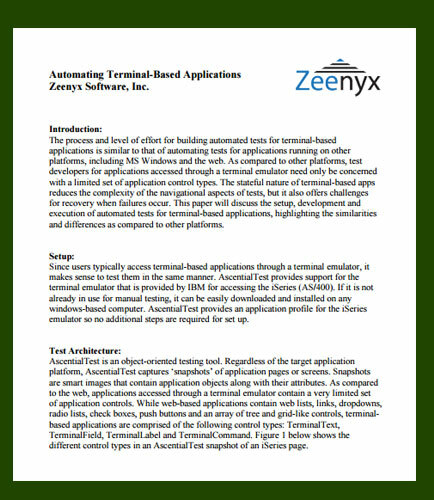 This whitepaper explains the setup, development and execution of automated tests for terminal-based applications, highlighting the differences and similarities as compared to other platforms.